After a quick search on google, I discovered the true meaning behind the dog days of summer. 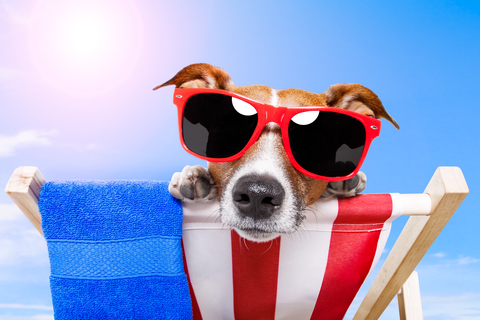 Dog Days is the name for the most sultry period of summer, from about July 3 to Aug. 11. Named in early times by observers in countries bordering the Mediterranean, the period was reckoned as extending from 20 days before to 20 days after the conjunction of Sirius (the dog star) and the sun. (Yes, I copied and pasted word for word, but I’m not being graded on creativity so I thought you wouldn’t mind.) I don’t care what Sirius is in conjunction with, or what it has to do with the dog days of summer, for me, it has a different meaning. When I was a kid growing up in the far southwest corner of Oklahoma, I knew exactly what it meant. As the temperatures soared to a steamy 100⁰ with not a storm cloud in sight, I sought shelter beneath the giant shade tree that stood just off the front porch; the family dog, a female shepherd mix, sprawled out beside me. On days like that, she would slowly move from one shady spot to another, her tongue hanging out like a dry sponge seeking moisture. My older sister would lie on a towel in the side yard with the radio blaring and a bottle of baby oil tainted with iodine by her side. She was shiny and slick and her fair skin would blotch red within minutes. I knew she wouldn’t last longer than it took me to ride my bike to the city pool. I would meet up with my best friend, and we would swim in the steamy hot bath oversaturated with chlorine until we were so water logged, we couldn’t even float. By afternoons end, I was limp as a wet noodle, my sister was fried like a crispy strip of bacon, and the dog was still sleeping on the front porch. But when night fell on my tiny town and the wrap-around porch on 221 West Friendship, the night crawlers came out to play. With my best friend and younger sister, I ran barefoot in the yard, playing everything from freeze tag to hide and seek. When the mosquitoes had devoured 1/3 of our blood, we would retire to the porch roof (yes, Mom, I said it) and stare at the stars. Life was simple and beautiful and mysterious. As a stay at home mom, it was my responsibility to keep my young children entertained when the dog days of summer filled our house with the constant phrase, “I’m so bored”, and I think I did a pretty good job. After all, life was different. Children couldn’t roam the streets like I did. There were too many cars to ride a bike safely, too many predators lurking around the corners, and too many video games to worry about who could run the fastest or climb to the highest tree branch. In my quest to keep the kids satisfied and my sanity in tack, I ran the gambit with slip-n-slides, sprinklers, and water guns. One of our favorite activities was to fill a wagon full of water balloons and wait for Daddy to come home from work. I sat casually on the front step and waved as he pulled his blue Sunbird along the curb, hiding a snicker when the kids ran out from the bushes and bombarded him. He was always caught off guard but still managed to catch a few balloons and chase the kids down until they were soaked from head to toe. Life was fun, beautiful, and unexpected. My children are more or less (mostly less) grown now, and my daughter just began her senior year of high school. Summer flew by and there just wasn’t enough time to worry about the dog days of summer. Now, it’s about finding the time to spend together. Life is fast, short. Living in East Tennessee, the summers aren’t quite as hot as I remember. I still have a dog, a dachshund with a big round belly that is covered with freckles, and I have a front porch. When the day is near the end and the sun is setting, an orange glow lights up Justin’s garden on the hill. The yellow swing shines like the bright morning sun, and the gray memorial stone engraved with his name and the words Love is Forever, reminds me that life is precious.